Have you ever been scolded by a deer mouse? I have. That was just one of the new experiences I’ve shared with visitors in the past few weeks, now that the cranes have returned to the Platte River Valley. Sandhill cranes roosting on the Platte River in Nebraska. March 2007. I actually got scolded twice. When a deer mouse scolds you, it sounds like a cheeping bird: “ZHee zeezezezezeze”. That mouse was so put-out that her rumpus-room (our crane blind) was filled with people, she stuck her head out of a hole in the wall and twittered at us to scram. I cannot imagine that telling-off a roomful of large predators is evolutionarily adaptive to a small mammal, but evidently even mice can be curmudgeons. Our group of large predators was gathered in the blind to stalk cranes. The snow geese, Canada geese, and Sandhill cranes have all returned to the Platte River. If you angle your neck to look straight up in the sky, you can see threads of birds waving and intersecting with the breeze. Their numbers are unlike anything I’ve seen back east. The way they ride the wind at different heights, so you see and hear layers of their lines crossing in the air, is totally mesmerizing. 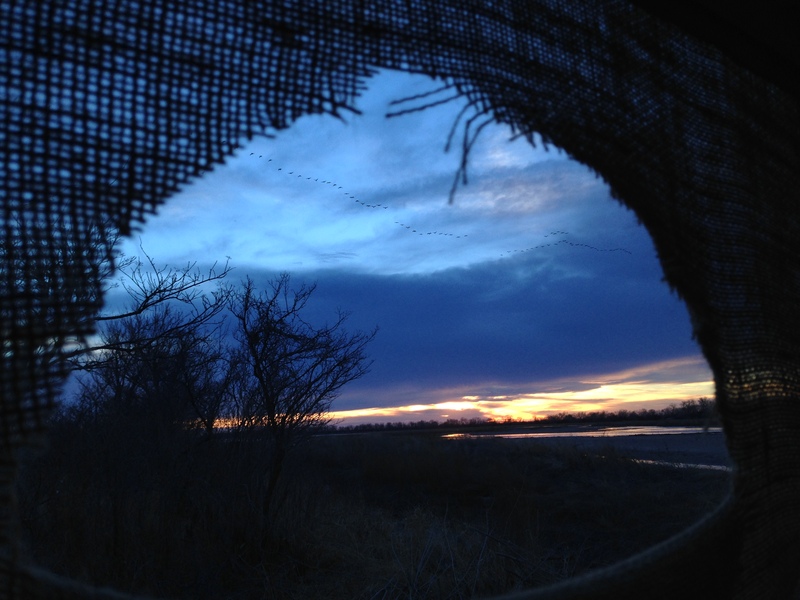 The night before last the cranes roosted directly downriver of our large blind. At first, we weren’t sure we’d get to see any of these birds up close. Whirlpools of birds circled and landed below the western horizon, their skinny long legs stretched out in front of them. They flew low overhead, but they didn’t seem to find what they were looking for in a roost on our part of the river. A lonely Canada goose stuck her neck straight up and honked at the sky, trying in vain to call down companions. Then, as the sky was just beginning to darken, four cranes landed on a sand bar about 50 feet down stream of our building. At first they just stood around, sometimes pacing in their goofy prancing walk, as if waiting for their cue. More cranes passed overhead, but continued to settle downstream. Finally, a line of cranes heading east noticed their comrades loitering down below. They trilled loudly and initiated their descent, wings cupped like a parachutist and legs stretched out. After the first large group settled with our four pioneering friends on the near sandbar, the population of cranes downriver swelled and built upon itself. Cranes are gregarious birds, so a few trendsetters can determine where everyone sleeps for the night. Looking out the crane blind, cranes flying by. Photo by Anne Stine. Cranes may roost on the river, but they don’t linger there all day- they have work to do. The next day we were mowing and raking burn breaks in our prairies when we heard a party going on in the trees at the north end. The cranes were feasting along the stream! Half the flock would rise and trill, and then settle, while the ones on the ground poked around, looking for invertebrates. We worried about flushing them from their daytime hunting grounds, but they didn’t seem to mind us too much as long as our machinery kept moving. Seeing these pre-historic goofballs reminds me that spring is upon us, and soon I’ll be trading my hot tea for lemonade and my fuzzy robe for a hammock in the yard. I can’t wait. 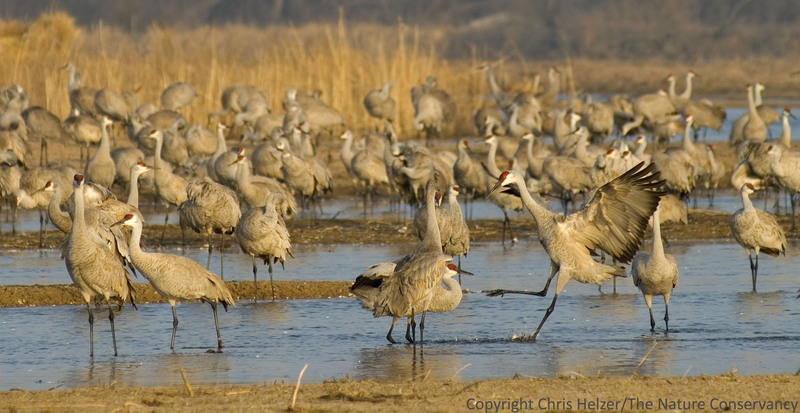 This entry was posted in Prairie Animals, Prairie Natural History, Prairie Photography and tagged anne stine, hubbard fellowship, nebraska, platte river, sandhill cranes, spring by Chris Helzer. Bookmark the permalink. Once again Chris, Thanks for the memories. This is very descriptive writing. It was poetic.